SD: I have always loved the business and I was motivated by Trish Stratus to get into this sport. Me and Trish (at the time) was the same size. 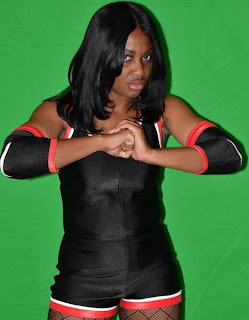 I felt that if she can do it, so can I. I started looking for a gym and found ACPW (American Championship Pro-Wrestling) gym in Fishtown, Philadelphia, PA and after 1 year there I finished my training at Devastation Wrestling Federation University, in Pennsauken, NJ to which I still train to this day. SD: I always loved Triple H. Triple H had so many personalities and characters and like me, went through many changes in his career before he actually made it. I loved the fact that he wasn't the most liked nor the most hated wrestler, he was a wrestler that many people didn't get onto until it was impossible not to get him. I look up to him alot. MEBD: They everyone has their "mark out" moments, when was your biggest? SD: My mark out moment for sure was when I attended a live Raw in Philadelphia. The match was a cage match between Kane and Edge and all of a sudden, I feel a tap on my shoulder. It was Matt Hardy. He asked me to stand there until he told me to move. He told me to move and then he charged the ring and beat up on Edge. This was during the time Matt was crashing Raw and Smackdown to attack Edge for sleeping with Lita. MEBD: How do you manage your personal life and professional life especially as a married woman? SD: It is relatively easy believe it or not. My husband is also in the business and he understands what I am doing and trying to accomplish, as he was in the business 15 years. I always include my husband and my son in every decision I make and I feel that without them this wouldn't be possible. MEBD: Which promotions do you wrestler for? MEBD: What would you say has been your best match and why? MEBD: Who is your favorite in the WWE right now and why? Have you met them? SD: My favorite right now and always have been on the indy circuit was CM PUNK/PIN UP STRONG QUEENS BETH AND NATAYLA. These workers along with ROH's Daniel Bryan (Bryan Danielson) and Evan Bourne shows that Indy Guys and Girls can make it in this business and doesn't need to be developed in a WWE/TNA farm to be over. They show that with hard work and dedication, you will make it to heights unknown to anyone but you. I haven't had the pleasure of meeting them but I hope to very soon. MEBD: I see you are an active participant in wrestling groups on facebook, do a lot of the other fans know you are a wrestler and if so are you flooded with questions? SD: Yes and No. Some people still doesn't realize I am a worker. I don't always throw it around however they respect my opinions. I have had alot of questions and requests and the response is good. I really enjoy being apart of these groups and reading what the fans want so that I know what I need to do for my own knowledge. SD: As long as they are paying attention, that's all that matters to me. MEBD: What is your dream WrestleMania match? SD: Natayla vs Beth Phoenix vs Kharma....epic! MEBD: Anything you want to say to the fans? SD: I would like to thank all you for making professional wrestling what it is today. Because of your dedication to this sport, it allows workers like myself and others to perform and travel out of our comfort zones and into your minds, hearts and souls. This is more than just a hobby or a sport, this is my life. I would love to perform for all of you one day and one day that will be a reality. Remember, believe in your dreams and never let anyone take away your dreams. Make your dreams a reality for yourself and the answers to the questions the haters ask. Like Simply Dvyne's fan page on facebook!